The really nice thing about this list is that the columns are configurable1 and you can sort by any column just by clicking the column header. Finally an easy way to see versions and builds and whatnot at a glance. This screen had its issues—the list of apps, for instance, is every app you’ve ever bought, whether or not it’s installed. And scrolling the home screen layout section on the right could be really slow and painful, even on a high-end iMac. There’s also a lack of information about each app—no version number or developer name, for instance. 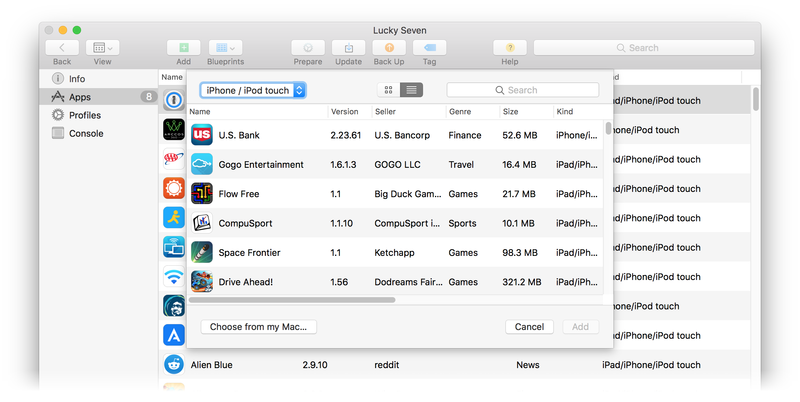 This list contains just those apps installed on the iOS device, and like the summary device info table, you can sort by clicking on any column heading, and you can add/remove columns. (There are only two more that I haven’t shown here—release date and purchase date.) You can see version and seller and genre at a glance; I particularly like sorting by genre when trying to thin duplicates off my iOS devices. This is actually more than a simple sheet—you can sort it by clicking on the column headings, or right-click on a heading to customize the fields you see. There are actually a couple more fields here than in the installed app view, and you might find the Minimum OS Version column quite useful if you have an older iOS device that can’t run the latest version of iOS. This is one area where Configurator leaves iTunes in the dust: Rearranging apps is much simpler in Configurator than it was in iTunes…and so far ahead of doing it on an iOS device it’s not even worth comparing. One of the main problem in iTunes is that it expanded every folder, and showed your actual device’s wallpaper. Both of these things lead to slowdowns—lots more things to scroll through, and slow while the computer renders the wallpaper. 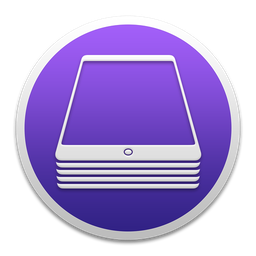 You work with folders much as you would if you were directly on an iOS device: Drag an icon over a folder and hover until the folder opens to drop inside a folder (or just drop on the folder, if you don’t need to see inside). To move out of a folder, it’s a bit different: Double-click to enter the folder, then start dragging the icon you’d like to remove. Drag it over the small ‘x’ at the left edge of the window, and the folder will close. Now drag to the desired destination and drop. 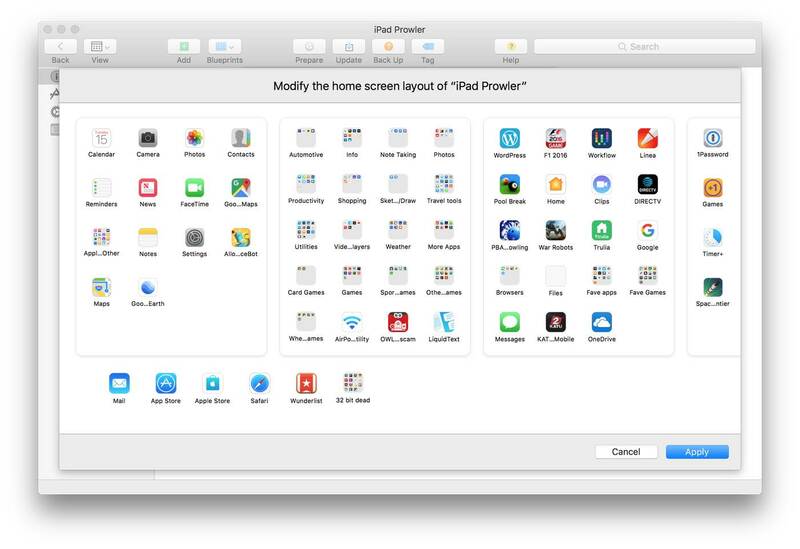 You can even select multiple items with a simple drag operation; in iTunes, you had to open each screen, then Shift-Click to select more than one icon. 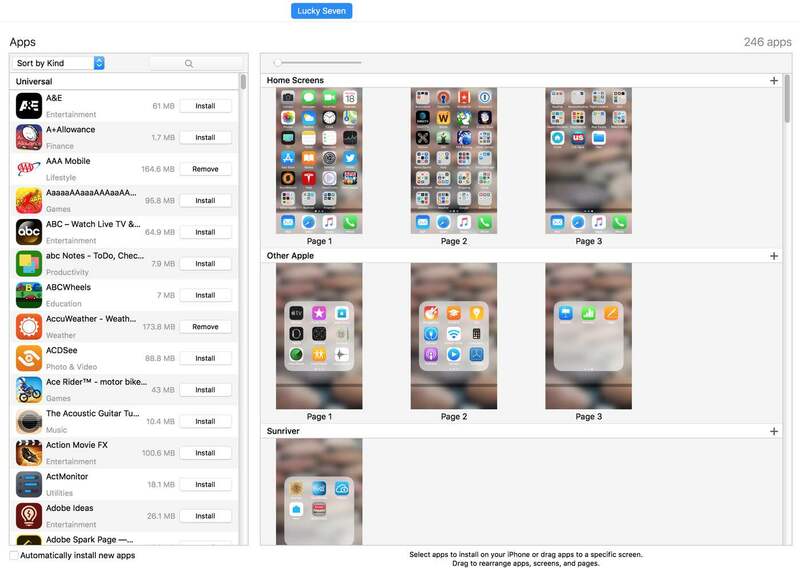 This is, by far, the fastest way I’ve found to organize my iOS devices’ screen layouts. This writeup just touches on some of the things Configurator can do. As seen in the Actions menu, there’s a lot more. 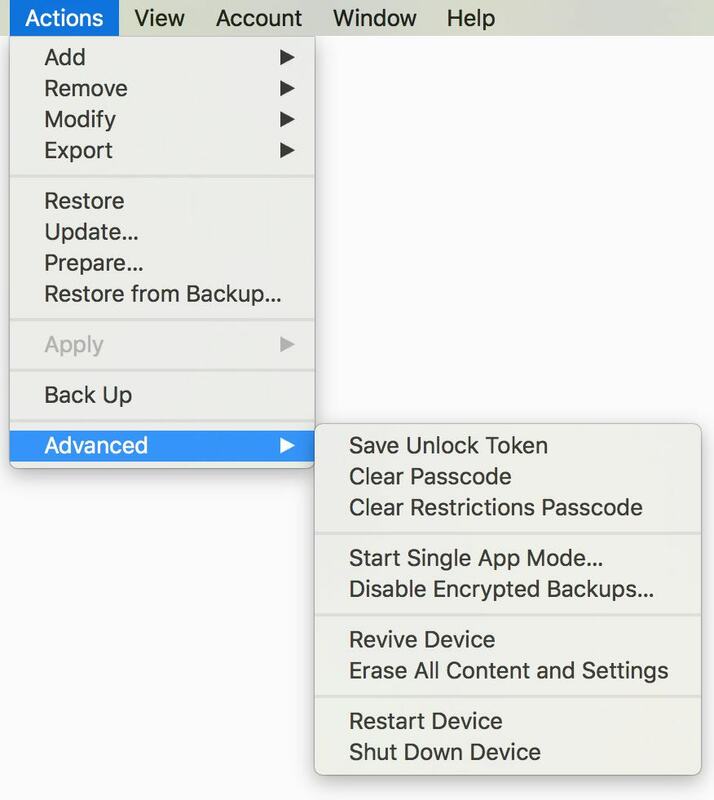 Change the wallpaper (in the Modify item), add and remove documents and profiles, export device info or documents, back up and restore, etc. If you set your device to be managed, you can do even more, including enabling single-app mode, which forces the device to run only one app. Such tasks are well beyond the scope of this writeup, not to mention my experience level. But if you’re looking for a way to better manage apps on your device in this era of “no iOS apps in iTunes,” take a look at Configurator. 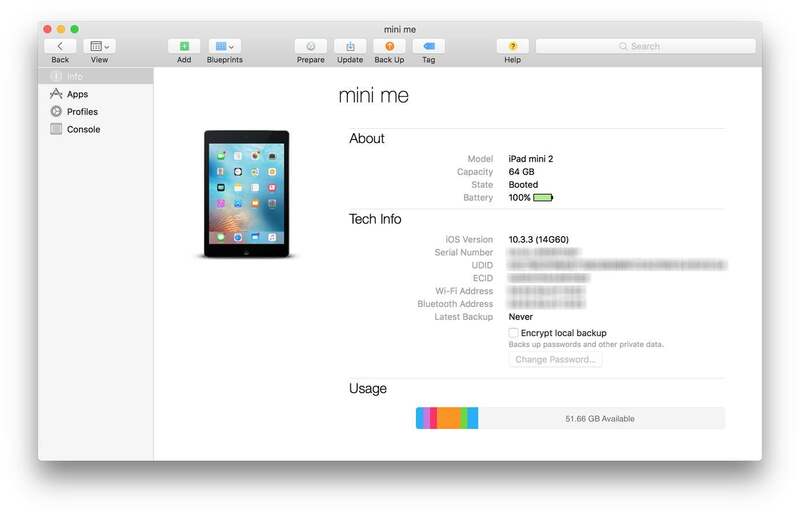 Configurator looks very cool. I hope you’ll do a followup to this and explain how to get staarted with it. I tried Configurator but found it disorienting . For example, after plugging in to a lighting cable and my phone appeared. I selected an “Apps” menu and then “Update” (if memory serves). Configurator began showing a progress overlay and it looked like my Apps would updated. It never did. Ran for many minutes and it took much longer than a similar operation in iTunes. Clearly, I neglected to do something prior to this operation. Not sure what to say, other than the usual idiocy of “Well, it works here.” Because really, that’s that—it definitely took longer, but it did update my apps. Nice. Does Configurator show apps downloaded, not installed and not in the cloud? Ie, I have some apps purchased from a previous Apple ID still stored in iTunes and stored locally on my Mac plus others that are no longer available on the App store. It can’t see them automatically; you can add them by pointing to them within the Add feature, though. Not from iTunes. If you have the Mobile Apps folder, you can reinstall from there, I believe—I haven’t yet tried this. I guess what I was actually asking is can Configurator 2 on my MAC access uninstalled apps after updating iTunes. Searching for apps on my device is no big deal for me but being able to “administrator ” all of my apps from my Mac is important. It would be like they only removed the app store from iTunes. I am OK with that. With so many complaining about the loss of app support, why are you the only one showing a solution? I haven’t updated iTunes or Mac OS because of the loss of app support. Configurator 2 may be a lifesaver for many! I think people are hoping Apple has a plan for a new centralized App Store app … or nobody uses a desktop any more, so they just don’t care. What I don’t think Configurator does ( or any other 3rd party software for app management) that the iTunes with an App store did was allow you to see updates for apps both installed and not installed (in your library) that allowed me to rediscover apps (that I had removed from my device for various reasons) because of new features or changes etc… The iOS App Store simply provides a list ordered by last purchased date, which makes the discovery of compelling app updates impossible. Are you able to rearrange the screens? Dragging them left or right? Yes, you can drag entire screens around. Is there a nuance or trick to rearranging the screens? I’m on the latest versions of the configurator, Mojave, and iOS 12. I can get a screen to highlight, but can’t get a screen to move. I haven’t yet upgraded my iMac to Mojave, so I can’t speak to that. But in High Sierra, just click-and-hold on one of the screens, then drag.